Greek philosopher Socrates once said, "Education is the kindling of a flame, not the filling of a vessel." The heritage assets managed by the Architect of the Capitol's (AOC) Curator Division document the historic moments and changing attitudes of the American people. Walking through the U.S. Capitol to experience the art and architecture maintained by the Office of the Curator, looking through photographs taken and preserved by the Photography Branch, or reading historic manuscripts and architectural drawings managed by the Records Management and Archives Branch provides an unparalleled education about the work of the AOC, our democracy and ultimately our nation. The Curator Division's three branches play a critical role by serving as the memory of the U.S. Capitol, and all three are necessary to help tell America's story. Collectively they create and preserve information on the art, artists, buildings, rooms and landscape features located across the Capitol campus. The Division is also the repository of records that tell the institutional history of the Architect of the Capitol, and its project-related documents are invaluable resources for the agency's maintenance, remodeling and new construction work. Wolanin examines a painting of Benjamin Franklin. 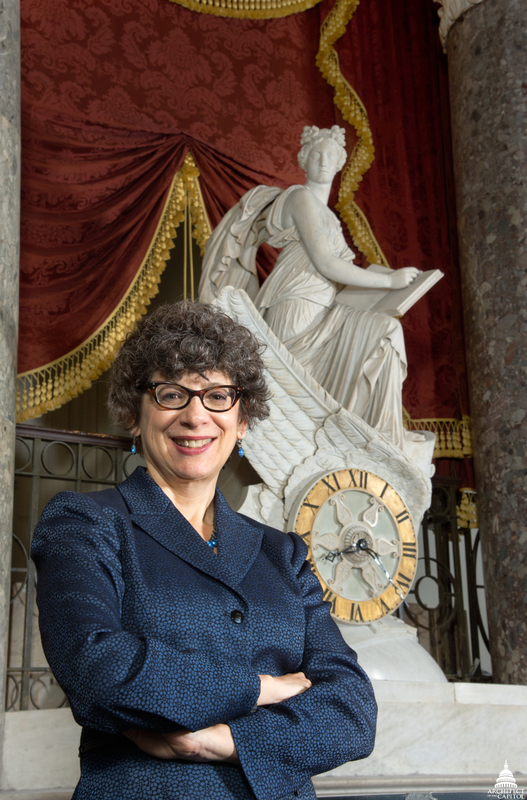 Dr. Barbara Wolanin, now Curator Emerita, recognizes that serving as the Curator for the Architect of the Capitol was a "once-in-a-lifetime opportunity." Her first day with the AOC was September 15, 1985. Thirty years later, she is widely considered the preeminent authority on the art of Constantino Brumidi at the U.S. Capitol as well as a noted conservation expert. 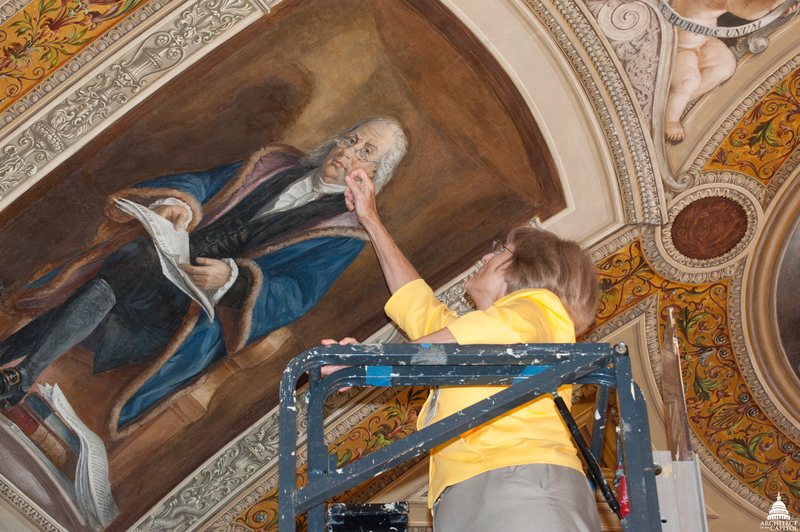 Conservation and restoration of the murals at the Library of Congress, the Statue of Freedom and the Brumidi Corridors are but a few of the Curator Division's accomplishments under her leadership. She is most proud of conserving and maintaining the murals in the Library of Congress Thomas Jefferson Building, which had not been touched since the building opened in 1897. A century of grime and neglect made the paintings dark and in some cases made it difficult to see the subjects of the artwork. Today, the vivid colors and details pop from the walls and ceilings above scholars and tourists walking along the mosaic tile floors of the Thomas Jefferson Building. "I loved being on the scaffold, seeing the lines and brushstrokes that the artists made and working with the conservators," said Wolanin. While conservation played a significant role during Wolanin's tenure, education was also a common theme in the work of the Curator Division. Education is a lifelong passion and pursuit for this group of employees. Their daily efforts at the AOC affect generations of students and beyond. This seems fitting for Wolanin, who left a teaching position at James Madison University to join the AOC. During her time as the Curator, Wolanin gave hundreds of speeches and presentations. She developed a fellowship program with the United States Capitol Historical Society, which to date has supported the work of more than 60 scholars. She regularly shared information with the Capitol Visitor Center (CVC) guides and worked with the exhibition team during the development of the CVC. Wolanin also worked on a variety of publications. All the while, she continued to be open to and enjoy learning more herself. In the 1980s, top mural conservators from Rome, Italy, who had advised on restoration efforts at the Sistine Chapel, were brought to the Capitol to support work on the Apotheosis of Washington. They were excited about the quality of Brumidi's art. Wolanin notes that she initially did not realize that Brumidi was such a good artist because so much of his original work had been repainted over the years. Thus began Wolanin's education about the Capitol artist and, ultimately, the painstaking effort to restore his works to their former beauty. It also led to her highly regarded book, Constantino Brumidi: Artist of the Capitol. "What the Apotheosis of Washington is painted on is really just an inch of plaster on a metal frame," she notes. "But restoring and preserving it for future generations, while a challenge, was one of my favorite projects, as was the Statue of Freedom, of course." 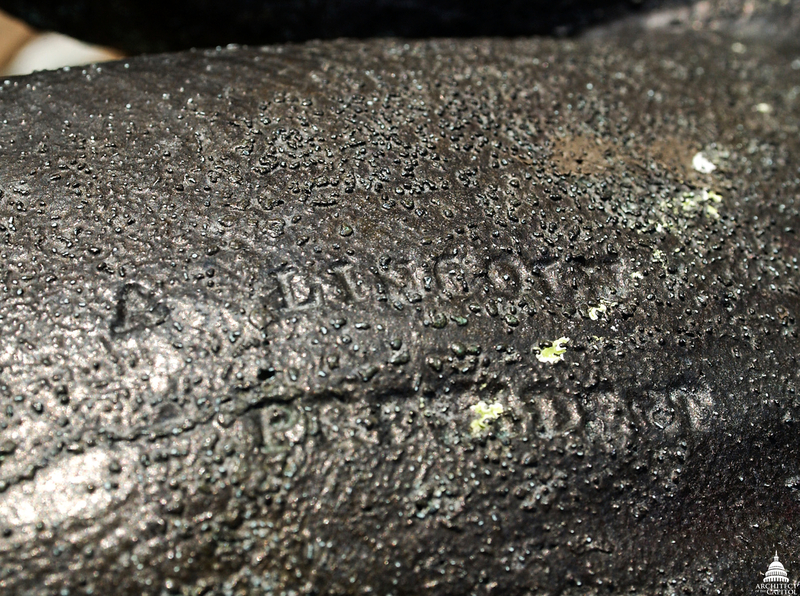 The Lincoln stamp located on the Statue of Freedom. Wolanin is one of the few people in history who have climbed to the top of the Capitol Dome, looked down at the feathers on top of Freedom's head, and viewed the stamped "A. Lincoln, President" which was put there in 1863. 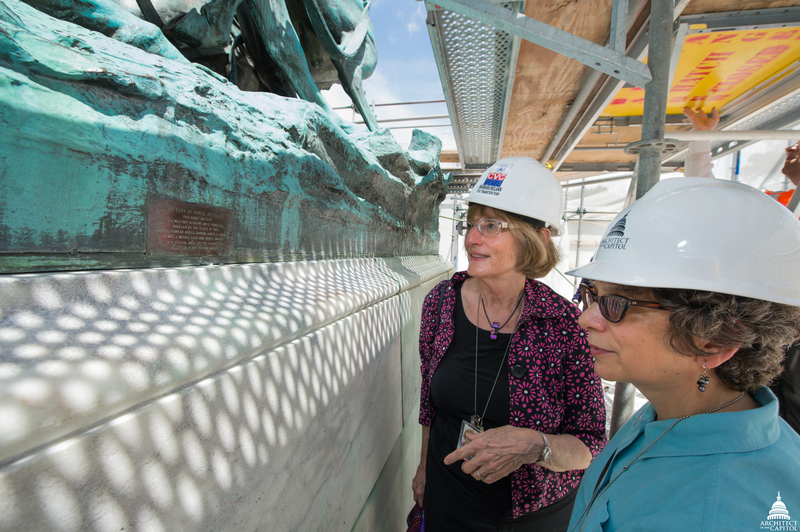 "I am proud of our conservation of the Statue of Freedom, especially in light of how difficult it is to reach her," she said. In 2014, Wolanin began her transition toward retirement. To ensure the transfer of institutional knowledge, a successor would shadow Wolanin on the job. The AOC selected Dr. Michele Cohen after a national search. Cohen in front of her favorite piece of art on the Capitol campus, The Car of History Clock, designed by Benjamin Latrobe and carved by Carlo Franzoni. Cohen brings an interesting mix of knowledge and experience as an art historian, administrator and professor. She holds a Ph.D. in American Art, and her scholarship includes books and articles about 19th century American sculpture, women artists, outdoor sculpture, the New Deal, and the art and architecture of the New York City public schools. Early in her career she co-authored the Art Commission and Municipal Art Society Guide to Manhattan's Outdoor Sculpture and more recently published Public Art for Public Schools, the first history of public school art and architecture in New York City. After heading up the sculpture inventory for the Design Commission of the City of New York for 20 years, Cohen then served as the founding Director of New York City's Public Art for Public Schools program. There she was curator of an existing collection of art placed throughout 1,200 school buildings and was involved in the commissioning of new art. "I oversaw hundreds of conservation projects and made some important discoveries, including the presentation plaster models for the doors completed by Herbert Adams for the Library of Congress," said Cohen. Moving forward, Cohen plans to juggle the duties of the Division while focusing on foundational longterm projects, such as establishing a comprehensive collection data base and digitizing records, while researching and responding to everyday inquiries. Like her predecessor, she will manage the fellowship program and also be involved in numerous conservation projects. Wolanin and Cohen examine the Grant Memorial. One such project is the restoration of the Ulysses S. Grant Memorial, which has captured her imagination. Situated west of the Capitol in Union Square at the edge of the Reflecting Pool, the memorial honors the Civil War General and two-term President. "You can sit on a bench and almost feel like you are in the action; you can hear the cavalry charging," said Cohen. "It is like watching a movie. It's so dramatic," she said. Preservation and restoration of the Grant Memorial to its former glory is one of many tasks that the Curator Division must meet in carrying out its overall mission, which is to oversee the museum, historical, documentary, records management, archival and related educational functions of the agency. Such a varied range of activities requires close cooperation among the Division's three components. The Curator's Office oversees numerous art conservation and maintenance projects, educational lecture series, and research requests. This office is also the initial point of contact for AOC staff and outside researchers who need access to the variety of text and photographic records that the Division preserves. The Photography Branch, led by Michael Dunn, creates and maintains the photographic documentation for the agency, providing the visual record of the buildings, people and artwork of the Capitol campus. 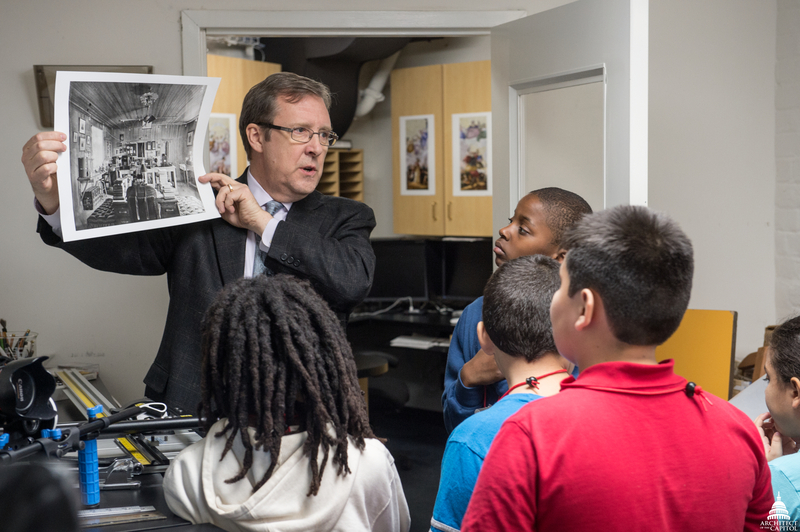 Dunn teaches children about working as a professional photographer. On a given day, Photo Branch photographers might shoot architectural elements, special events or construction projects. According to Dunn, "We might have a photographer in steel-tip boots, jeans and fall protection climbing on scaffolding in the morning and in a business suit and tie for a VIP event in the afternoon." This diverse collection of subjects is important in telling the complete story of life at the Capitol today and for future generations. It also ensures that the agency has a visual record to consult. Recently, the branch used 30-year-old photographs to inform construction crews about details of an ongoing project. "A photograph taken all those years ago helps us to do our work more efficiently and save the agency money," said Dunn. 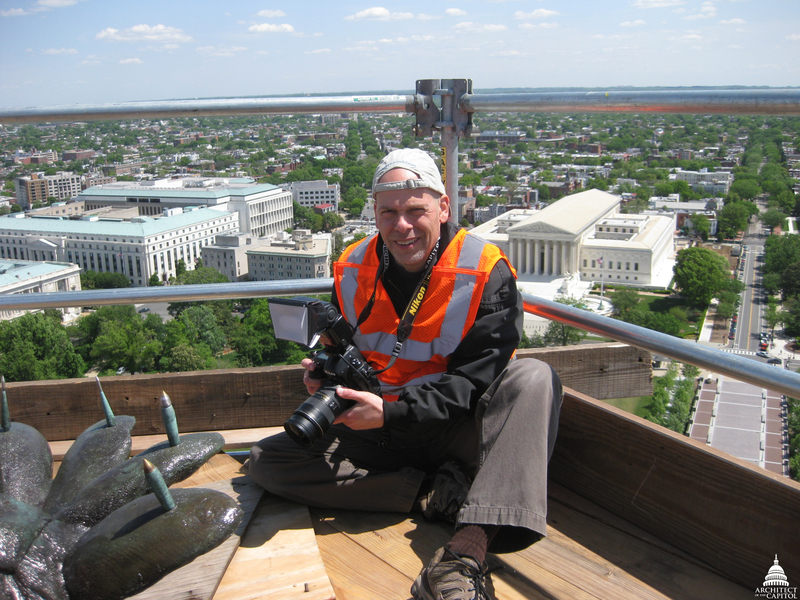 Photographs taken by Chuck Badal provide a visual record of the repair work on the U.S. Capitol Dome. When asked about the skills necessary to be a successful member of the Photo Branch, Dunn responded without hesitation, "Life-long learners with a sense of curiosity." As a new era begins under Cohen, Dunn is most excited about her freshness of vision, breadth of expertise and dedication to public art. "Michele has a commitment to public art on the broadest possible scale. She is developing relationships with a global perspective," said Dunn. The Records Management and Archives Branch is the agency's paperwork guardian, maintaining an inventory of records; assisting with the management of files; and keeping historical manuscripts, contracts, drawings, studies and diagrams. 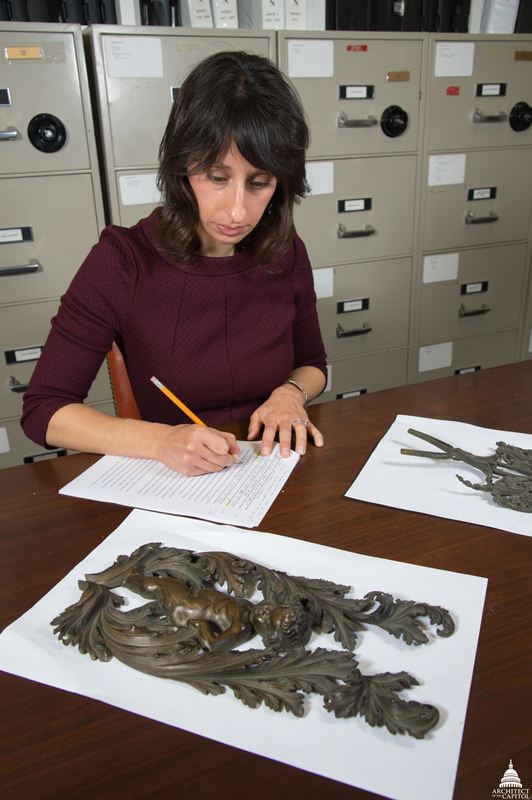 Stacie Byas, Branch Chief, manages a team of four who spend a good part of their time digitizing the collection to ensure long-term access to files. 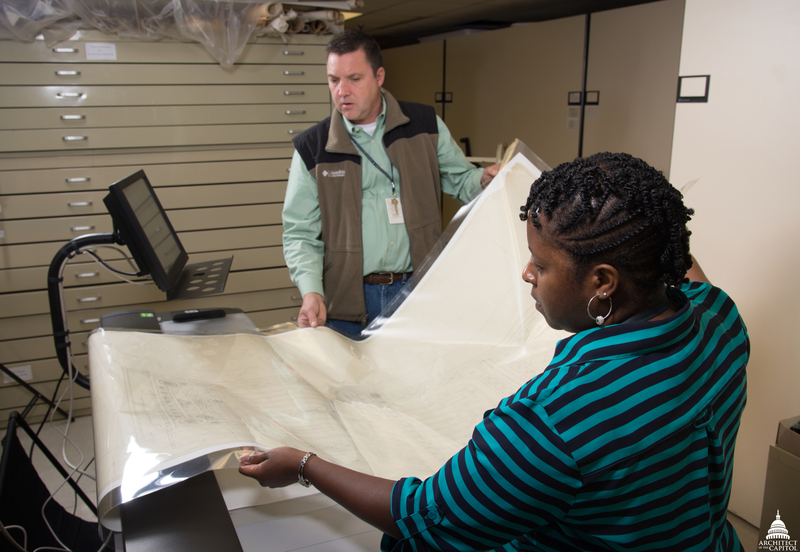 Jim Corbus and Jocelyn Travers, Records Management and Archives Branch, preserve historic architectural drawings. The Records Management and Archives team is a group that is rooted in history, with forwardthinking attitudes. "For us, 100 years is young. We are thinking ahead in terms of all of the various formats of records and materials. We are not just thinking about the archives in their current state; we are thinking ahead to preserving information for 3015 or 4015, for the life of the Republic to ensure that information in various formats will be useful in the future," said Byas. Jennifer Blancato, Office of the Curator, carefully analyzes art. The start of Cohen's tenure as Curator is exciting to the Records Management and Archives team. According to Byas, "She gets our work, and that isn't always the case in some offices. Michele recognizes that public art and public space is very valuable. She leads with her passion for art and ability to share and educate others." The Torch of Knowledge, covered in shining gold leaf and sitting atop the Jefferson Building of the Library of Congress, faces the Capitol Building where the Office of the Curator resides. The torch serves as an inspiration and a reminder of the importance of a constant search for knowledge. It is in some way a perfect allusion to Socrates' notion of education. Of course, the Curator Division already knows that! Cudos to the incoming and outgoing curators. Two fine Americans who love what they do, it shows. What a great job you all have ! Thank you!